The Nokia 130 is another basic mobile phone released by Nokia in September 2014. This year saw Nokia bring to the market more basic mobile phones than before. This year also saw the release of the Nokia 225 and the Nokia 225 dual which are much like this phone being very basic in their options. Clearly Nokia is aiming very broad with more third world countries coming into the digital age. The Nokia Lumia 520 is still however one of their most popular and best mobile phone to date. The Nokia 130 is a basic phone with only 2G ability. It covers the GSM 900 / 1800 network range and nothing else. The design is also very basic with a TFT, 65K colors screen at 128 x 160 pixels. It has he standard jack as well as a loudspeaker. There is also only the option for Vibration and Polyphonic tones. The card slot is a microSD with up to 32 GB of storage. There is also GPRS, Bluetooth and microUSB v2.0. There is no EDGE with this phone and it also has no camera. The internet access is also via WAP 2.0/xHTML, HTML. It has a standby time of 864 hours and a talk time of 13 hours. We have added the user manual below if you wish to see before you buy. For the price it is a good phone and beats buying another second hand basic mobile phone. The Nokia 130 is a very basic mobile phone and the user manual is best done by explanation. 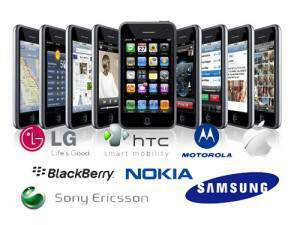 Below you will find the most common questions about the mobile phone which is normally found in the user manual. The user manuals of these phone are pretty useless so I am busy replacing all of them with proper explanations that are easy to understand as from October 2017. Select Menu > Settings > Dual SIM settings. To choose which SIM to use for calls, Select Default SIM for calls and then the SIM you want to use. To choose which SIM to use for messages, Select Default SIM for msgs on the SIM you want to use. The volume on this mobile phone is very easy to change. Look at the picture below. 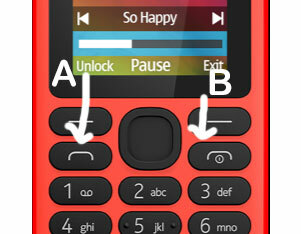 Press on the Left Side (1) of the button for low volume and press on the Right Side (2) of the button to increase the volume. You will now be able to click on the wallpaper of your choice. This will become the new background of the phone. Menu > Settings > Tone settings. Now the phone might ask for a SIM and you will need to select a SIM that will be associated with this ringtone. You can hence setup a ringtone for each SIM. Many use one SIM for business and the other SIM for personal calls. You can allow a different ringtone for your business or home like this. You may or may not have this option. 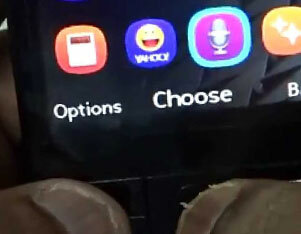 Now select the ringtone you want for the SIM and clock on OK. This will now be saved for this SIM card. You can repentantly press a character on your phone in order to write a message. In order to type in a space you can add 0. or if you wish to add a special character then you can press *. which will give you further options. If you wish to change the case of the letter from CAPITALS to lower then simply type in #. which will change this for you. To add a number simply press on the number and hold it in for than one to add a number to your sentence. The phone has a built-in dictionary which can be used to predict what you might want to type. Note that this option in not available in all languages. Select Opt. > Dictionary and the language. Simply type in the telephone number you want. If you want to make an international telephone call then you have to press * button twice. This will add the traditional ++ of the international telephone numbers on for you automatically. Remember this when you place an international number into your phone book. Once you have typed in your number then you will need to press the button below shows as “A”. Since this is a dual SIM phone you will need to specify which SIM to use. To end your call press “B”. To answer telephone calls you will also need to press “A”. Select Menu > Contacts > Add contact. It will ask where to save the contact as its is a Dual SIM mobile phone. Normally people save the contacts according to which SIM is used for what. You can also give each person a different ringtone. You can also save numbers when you phone to receive a call by press Opt. and then pressing SAVE on the menu option. 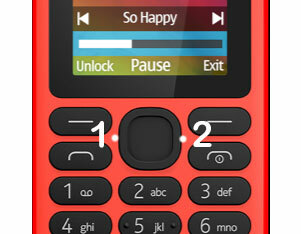 Sending a message on the Nokia 130 is easy as Menu > Messages then Select Create message and Write your message. If you wish to add a smiley you will need to press Opt. > Insert options to insert any of these characters in. There are two ways to send the message. The first is Opt. > Send and the other is by pressing “A” button as shown above in the picture. To read your messages you will need to press Menu > Messages > Inbox and it is as easy as that. Menu > Music > Music player then select Opt. > All songs. In order to change the speed, fast forward or backwards you must use the scroll key up or down to do this. You can set the alarms clock on the phone as explained below. Note however that there is a limitation of 5 alarms. You can select the hours and minutes by using the “Scroll Keys” as shown above in the Multimedia section explanation. You can set a Calendar date as explained below. Menu > Extras > Calendar now selected a date and Opt. > Add reminder and simply add your text. Now select alarm on or off which will give you a reminder by a ringtone. If you want to remove a calendar event then simply click on View Today then Opt. and delete the entry. You can change the date and time as follows on the Nokia 130 mobile phone. If you want to share contacts with another phone via Bluetooth then select a contact and then press the Options key then Select Share > Via SLAM. The contacts will now be transferred via the Bluetooth on the Nokia 130 mobile phone. To copy all your data onto your computer you must first select mass storage on your phone and from your computer you will browse to the phone as it will show on your computer as a hard drive or storage device. You can simply copy and paste from there. If you wish to check your mobile phones IMEI as the network might require this then simply dial *#06# and it will return your IMEI of the phone. 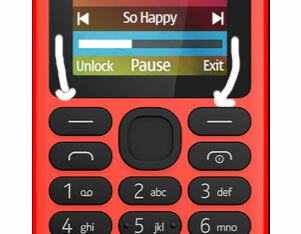 Also one last issue, the Nokia 130 does come with the option to vibrate as it is in the menu system. how do you turn on a nokia RM-1037 phone?